The first edition of The Basketball Diaries, the only one (from what booksellers tell me) that has any value as a collectors' item, has a number of distinctive characteristics. First, the cover photograph, by Rosemary Klemfuss (aka Rosemary Carroll), is in black and white with silver lettering. 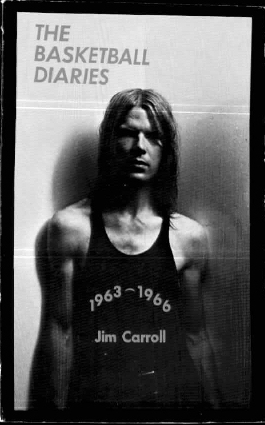 The back cover offers blurbs by William S. Burroughs, Jack Kerouac, Patti Smith, and Rolling Stone. Second, this edition is the only one which contains the sculpture-images by Marc Blane (aka "Mark Clutcher" in the diaries) on the title page and at the beginning of each section. Third, this edition includes a preface by Tom Clark entitled "Rimbaud Rambles On: By Way of a Preface to The Diaries." Fourth, in the text, numbers are written as numbers rather than spelled out: "The Biddy League is for anyone 12 yrs. old or under. I'm actually 13 but my coach. . . ."
continued until I was 15 nearing 16.